Born in Venice in 1983, Alessandro Taverna has already won numerous awards, including 1st prize in the Minnesota International Piano Competition, 2nd prize in the London international Piano Competition (playing the Chopin Concerto No.1 with James Judd and the LPO at the Royal Festival Hall (�50 minutes of flawless poetry � this young Italian is remarkable�� - The Independent) and Bronze Medal at the Leeds International Piano Competition. In September 2011 he won the Arturo Benedetti Michelangeli Prize as well as the Premio Giuseppe Sinopoli. Alessandro has already built an impressive career and has toured extensively in Europe, US, Canada and South Africa. On hearing him, the late Lorin Maazel invited him to perform, the Prokofiev Third Piano Concerto with the Munich Philharmonic in Vienna�s Musikverein in 2014. A documentary of his life and his performances at the Leeds Piano Competition was shown on BBC4. The Russian pianist composer Nikolai Medtner was a great friend and colleague of Rachmaninov. He too, left Russia after the 1917 Revolution, eventually living in London, where he died. In London, HMV recorded his three piano concertos and many of his other piano compositions, played by Medtner himself. Rachmaninov dedicated his Fourth piano Concerto to him and Medtner dedicated his own 2nd Concerto to Rachmaninov. Medtner�s contribution to the piano music of the early 20th century was important. His music is traditional, melodious, brilliantly laid out for the piano, and calls for great piano technique. 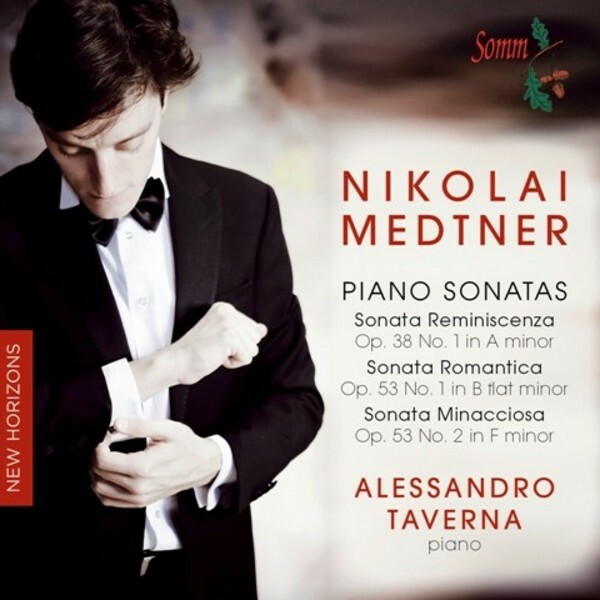 The three Sonatas on this CD show Medtner�s range very well. Alessandro has made a special study of his music, which he plays to perfection.